Ecumenical Patriarch Bartholomew expressed his unwavering support to Cyprus, wishing that the country will soon overcome the financial difficulties it is currently facing. According to an official press release, Bartholomew met with Cyprus Ambassador in Bratislava Marios Kountourides, during an official visit he paid to Slovakia. 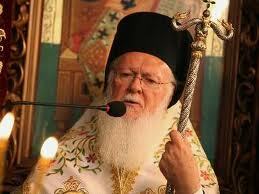 The meeting took place after an invitation extended by the Cypriot Ambassador to the Orthodox Primate. Kountourides informed Bartholomew on the current financial situation in Cyprus and the efforts of the Church of Cyprus to alleviate problems. As the Ambassador pointed out, the government and the people of Cyprus are determined to overcome the crisis. Bartholomew commended the humanitarian mission of the Church, both in Cyprus and Greece, and their significant aid to the people who are suffering from the impact of the crisis.